Vatican City, March 5–Courageous Syrian refugees and Nicaraguan farmers are the winners of the first-ever “Women, Sowers of Development” award, given to groups that empower women and fight hunger. Voices of Faith and Caritas Internationalis announced the two winning groups today at a press conference attended by a Syrian refugee and two Nicaraguan women farmers. They will receive the award itself at the “Voices of Faith” storytelling event on 8 March, International Women’s Day. The 10 000 euro “Women, Sowers of Development” prize for a Caritas project is awarded to Caritas Nicaragua for empowering rural women to grow more food to eat and to sell. The Caritas programme gives farmers seeds, training, and irrigation systems like motorised pumps and hoses. “In communities where women are sometimes devalued, these women farmers have been able to change their lives for the better,” says Juana Bertha Duarte Somoza, a Caritas Nicaragua staff member who accompanied farmer Alba Marina Rosales Ruiz to Rome for the Voices of Faith ceremony. Basmeh and Zeitooneh, an association helping refugee women who live in Lebanon, will receive the 10 000 euro prize for a non-Caritas project. Having fled the devastating war in Syria, many refugee women are alone with their children and have no way to earn a living. 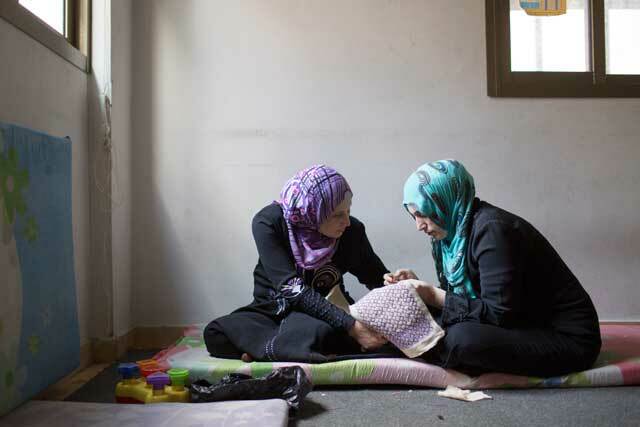 Basmeh and Zeitooneh runs an embroidery programme and other projects that help refugee women—both Syrian and Palestinian—support their families. In addition to the prize winners, the press conference featured a speaker from the second annual Voices of Faith storytelling event, to be held on 8 March at the Casina Pio IV in the heart of the Vatican. Mary McFarland shared highlights of her upcoming talk “From Teacher to Student to Teacher: A Living Conversation about Education in Refugee Camps”. McFarland, Founder and International Director of Jesuit Commons: Higher Education at the Margins, gave a touching presentation of the hope that comes with the gift of education. On Women’s Day, she and other women will speak about their work in accompanying the poor, upholding human dignity and promoting equality. For bios and photos please go to http://goo.gl/6C975K .